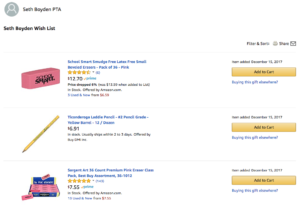 Help our teachers get the supplies they need by purchasing items for Seth Boyden from our Amazon wish list! Many of the items on the list are less than $10, and almost all are less than $20, so this is an easy and inexpensive way to contribute to the school. And when you make your purchase through Amazon Smile, our school gets a percentage of the sales price, so you’re actually contributing to Seth Boyden twice! This entry was posted in Fundraising, PTA, School, Seth Boyden News. Bookmark the permalink.